Semicon West preview: MEMS designs are about to change in some very fundamental ways. Look what’s coming. While MEMS sensors and actuators are key to enabling most of the high profile markets of tomorrow, from wearables to smart objects in the Internet of Things, MEMS companies face challenges today in transitioning to those new opportunities as basic MEMS devices increasingly becoming commodities. Large corporations are hiring their own in-house MEMS engineers, as standard platforms ease integration and programmable ASICs ease design spins, and new materials and smarter software enable new applications. Tough competition: Much of the growth in the MEMS market in 2013 was concentrated at a handful of companies, including Bosch, Knowles, Canon, Avago, and InvenSense. Chinese microphone suppliers AAC and Goertek also saw strong growth, to take share away from microphone market leader Knowles. But roughly half of the 30 leading companies saw revenues decline, as increasing unit sales did not make up for falling prices. While demand for MEMS devices continues its fast growth across all sectors, the relentless pressure from consumer markets and increasing competition continues to drive prices down and reduce margins. “Whatever the application, from microphones to even advanced 6- and 9-axis inertial sensor modules, the players who not so long ago dominated a niche with 70% to 80% market share now see their share dropping to 60%, 50%, or even 40%, as more players start to offer alternative products, and as prices keep coming down even more,” says Jean-Christophe Eloy, Yole Développement CEO and president, who will speak at this year’s SEMICON West MEMS program. MEMS makers have typically reduced cost by reducing die size, but the sensor die size has stabilized over the last few years as the sensing elements are reaching their practical limit of scaling. The next generation of inertial sensors will need to replace the traditional comb drive capacitive technology with some other technology. Some potential alternatives range from Qualtre’s BAW-based sensor to Leti/Tronics nanowire strain gauge that senses piezo-resistance, to mCube’s MEMS on CMOS approach, but introducing a new technology into a high-volume, low-price market is a challenge. The other path forward for successful companies is scaling to increasing volumes, and adding increasing value with integration, software or systems. Others can find it hard to compete with the high volume and diversified markets of an IDM like Robert Bosch, which not only sells its sensors but also its systems to the automotive market, while simultaneously growing a consumer business, notes Eloy. All that raises the major question of who will invest to add capacity to support future growth. The sector has yet to grow enough big fabless companies to support a large volume foundry business for its idiosyncratic products. 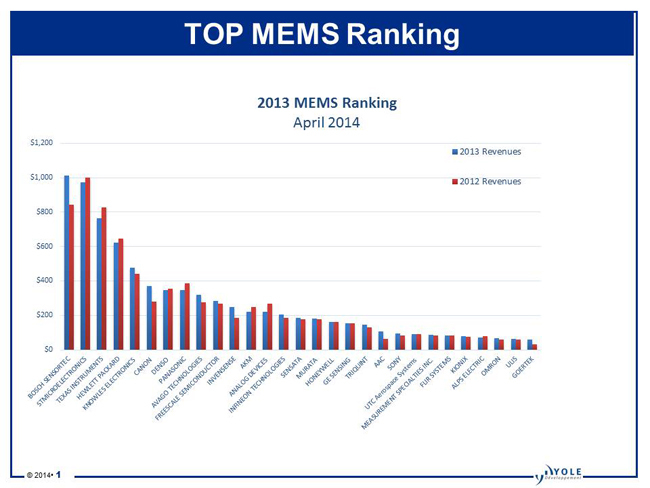 InvenSense and Knowles remain the only two fabless companies to yet make it into the top 30 MEMS makers, and total foundry production still remains under ~10% of total MEMS production value, according to Yole estimates. That suggests most future investment will come from the IDMs, which will weigh additional investment against the return on their IC business, and can capitalize on synergies with IC and systems business, says Eloy. Development of generic platform modules by multiple suppliers in the maturing MEMS sector helps ease the entry of these new players. Silex has focused particularly on integration/packaging platforms with its through-silicon via technologies, for relatively low-density connections, but through full-thickness wafers that don’t require special handling or bonding/debonding. Recently it has developed a through-glass version, with~30µm vias at <100µm pitch for capping RF devices, with more stable permeability than high resistivity silicon. The company also is working with IC foundry partners on a relatively low cost SiP solution using full-thickness silicon interposers with these metal vias and four layers of copper damascene for fine-pitch microbumping, allowing the user to buy the interposer with a microbump interface from the foundry, then get final packaging from the OSAT, without the thin-wafer handling and bonding/debonding issues. As smaller sensors require more sophisticated signal processing — and as the sensors themselves become more of a commodity — more value is moving to the ASIC, and spurring development of more support infrastructure there, as well. The ASIC can account for more than a third of the cost of a complex MEMS device, for more than about $3.5 billion worth of annual business, according to Yole estimates. And now a few suppliers are starting to offer programmable ASICs to reduce development time and cost. “It can take a long time to get from a MEMS prototype to an optimized working device, and a programmable ASIC to use in development can dramatically reduce time to market, from 18 to 24 months down to as little as 12 months,” says Scott Smyser, EVP of business development for Egypt-based ASIC design company Si-Ware. That company is making a version of the evaluation platform it uses in house available to customers to test their devices. The development boards offer a programmable ASIC for high performance single-axis inertial sensors, which can be adjusted for things like different capacitance ranges, drive frequencies and output parameters, providing the electronics for modeling and checking the MEMS device to ease the iterations required to tweak the properties of the sensor and evaluate its match with the controller. Originally designed for a single axis inertial sensor, the board can be used for multi-axis devices by daisy chaining units together. Users so far have ranged from companies looking to enter the consumer MEMS inertial sensor market to those developing high performance inertial sensors with particular capabilities. Si-Ware is also working now to extend the platform for more applications, starting with pressure, temperature, humidity and other resistant bridge and capacitive sensors. These speakers will be joined by Jack Young of Qualcomm Ventures on health and medical sensors; Chris Keimel of GE Global Research on new metal switch technology; Arjen Janssens of SolMateS on PZT thin film technology, and others, in the MEMS TechXpot, Tuesday morning, July 8, at SEMICON West, discussing the coming challenges and opportunities for next generation MEMS. Register here.